Taking a slight detour from our Crisis on Infinite Earths coverage, I thought it would be a fun idea to see what the fandom thought about the pending arrival of Marvel mainstay, John Byrne (Uncanny X-Men, Fantastic Four, Alpha Flight) to the DC landscape. Byrne was set to revolutionize Superman with his Man of Steel six-issue miniseries which would launch into Superman v2. This will likely be at least a two-part Usenet Fandom feature. John Byrne's DC Comics arrival signaled the change in status quo for the character who people picture when they think "superhero". Many people think Byrne may have been brought in to "Marvelize" DC’s top dog. What that the case? Well, I suppose one’s mileage may vary. The "new" Superman was brought somewhat "down to Earth" insofar as his power set, and the stories felt as though there was a cohesive narrative that must be read sequentially in order to get the most out of it. Personally, I have a... limited knowledge of the Pre-Crisis Superman. I know he was much more powerful, and from what I’ve read, many his adventures felt as though they could be read in any order without sacrificing much in the way of understanding. I definitely throw my hat into the "Byrne/Post-Crisis Superman Fan" club. With that out of the way, let's hop into the first half of a massive-missive by one "SM", "John Byrne/DC Rumor" dated October 15, 1985. Let's start at the beginning, the reintroduction of Superman's cast of characters. Lana Lang, as mentioned by SM was romantically linked with Clark Kent just prior to the Crisis, during which time the two worked as co-anchors for WGBS-TV News. In the Pre-Crisis issues I've read, including, and perhaps especially the Mindy Newell/Gray Morrow Lois Lane two-parter: When it Rains, God is Crying, I could not help but feel the Clark/Lana relationship just felt wrong. The film, Superman III (1983), introduced Ms. Lang to a wider audience and may well have been the catalyst for their on-panel relationship. Following the Crisis, Lana appeared to be restored as Clark’s childhood friend. They loved each other, certainly... but Clark's love was more platonic than romantic. Lana would eventually marry another old friend of Clark’s (and future President of the United States) Pete Ross... Meaning Lana became more than just Clark’s "first lady". The Kents being left alive was something I had always enjoyed. I felt as though they tethered Clark... kept him humble. He could save the world a million times over, yet at the end of the day, he was still Martha and Jonathon Kent's beloved boy. This was the way an entire generation of fans saw Clark’s family dynamic. The television shows Lois and Clark: The New Adventures of Superman (1993) and Smallville (2001) both played up the parental angle as well. The Superman/Batman dynamic took a turn for the contentious following the Crisis and Man of Steel. As quoted by Byrne, the two come from very different backgrounds and motivations. The Pre-Crisis World’s Finest appeared to be close friends, best friends even. Post-Crisis, Batman and Superman may have worked together from time to time but you didn’t really get the impression that they were all that chummy "off the clock". The Justice League was a completely different animal post-Crisis, to the point where Superman (and Batman... and Wonder Woman) were removed from taking part in its founding. Wonder Woman was replaced by Black Canary as a JLA founder. The only member of the "Trinity" that would be part of the Post-Crisis/Legends Justice League would be Batman. Superman would eventually join just prior to the Death of Superman storyline. Focusing on the "Man" more than the "Super" is perhaps what folks refer to as the "Marvelization" of Superman. Speaking personally, that is what drew me to this iteration of Superman. I want to see a Superman I can root for, one where the outcome is sometimes in doubt. 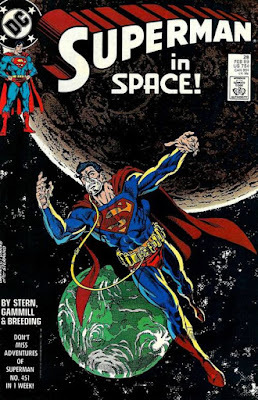 This "new" Superman needed to breathe, that is to say... he couldn't be out of the Earth's atmosphere for extended periods. When he would eventually go into Exile, he carried with him a breathing apparatus. This Superman would also, depending on how you look at it... make mistakes. Let's just say the semi-recent Man of Steel (2013) film wasn't the first time Superman killed. 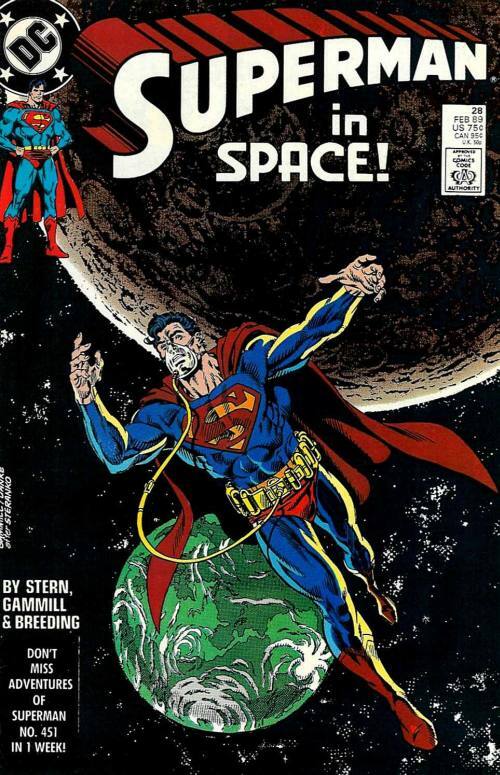 Byrne's take on Superman’s feelings of alienation are inspired. Clark Kent was indeed raised as a human. Although he has powers, all he knows is his human life. It feels as though the "alienation" angle is used fairly often these days. Superman as something of an outsider never really sat right with me, personally. I like to think of Superman as a man of the people. Even though he can perform amazing acts of strength and speed, he is still comfortable bellying up to a diner counter and drinking a cup of coffee with friends and strangers. The idea that Clark would not discover his heritage until over four-years into this launch is amazing. That was truly a surprise to read. Next time we will look at the rest of SM's (who I promise is not short for SuperMan) post, and perhaps some of the discussion prompted by it. I know some corners of the interwebs have amazingly knowledgeable and passionate Superman fans, so if you have any additions or corrections, please feel free to contact me in care of this web-site. Thank you for reading. Very cool to see primary source reactions on the subject. Having been born in the late 90s and only discovering comic books a few years ago, I never really "grew up" with any version of the character, but I find John Byrne's to be the most unique and interesting.